Peninsula Art Space is pleased to present Graham Wilson’s second solo exhibition at the gallery. Tired of Bal(d)ing Out includes two works, each occupying the front and back rooms of the gallery respectively. In the front room, Tired of Bal(d)ing Out, from which the exhibition takes its title, is an installation of used car tires, collected by the artist from local car shops. Referencing works like Allan Kaprow’s seminal Yard (1961), in which the artist famously filled up the courtyard of Martha Jackson’s Gallery with hundreds of used car tires, Wilson riffs on the affinity of the tire to tiredness and exhaustion, invoking a strand of material culture which has run its course. Impeding the trajectory of the viewer through the gallery, Wilson reconfigures the way one might engage with the unwieldy, heavy mass of a history he and others continue to accrue ad absurdom. A collection of receipts, accumulated over the course of four years, literally evokes consumption cycles embedded in a mode of engaging with materials that he casts off as expired in this presentation. 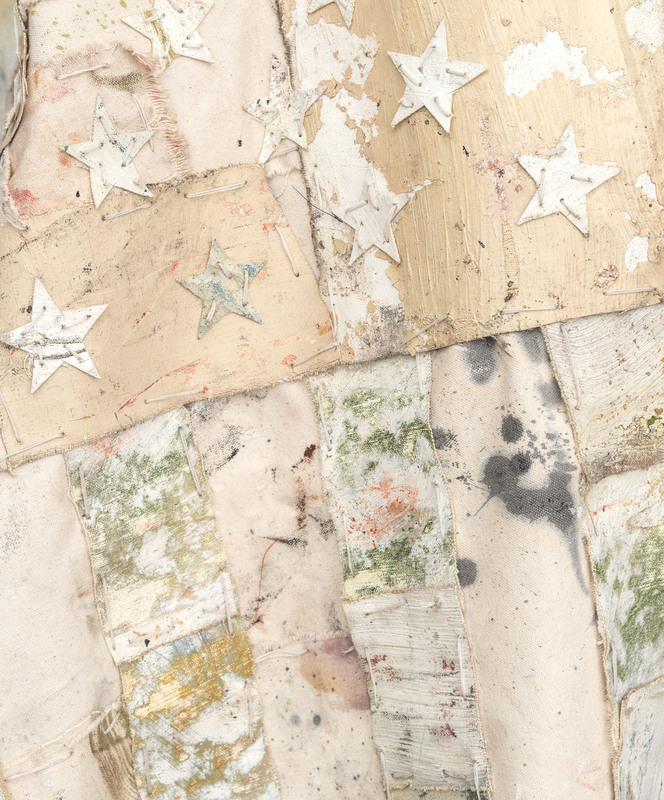 In the back room, Caustic White Flag (After Johns) employs Wilson’s signature quilting technique. Made from cut bands of paint-stripped canvas which have been sewn into a quilt together, the white flag — typically a sign of peacemaking and surrender in a time of strife — signals giving in to a new condition of art making and being in the world. Titled after Jasper Johns’ encaustic painting, White Flag (1955), Wilson’s painting enters the gallery after a stint on the street, where the artist — clothed fully in white — waved it before the United Nations Headquarters on 42nd Street and First Avenue. The action, which is otherwise absent from the exhibition despite it having been documented, took place when, remarkably, all international flags lining the side of the building had been removed from their flag poles: a strange and eery occurrence which read as both utopian possibility and dystopian breakdown. Graham Wilson (b. 1987 in Louisville, KY) lives and works in Brooklyn, New York. He has had solo exhibitions at MonCheri, Brussels (2014) and Peninsula Art Space, Brooklyn (2013). He has also shown in group exhibitions internationally, including at Valentin, Paris; Galerie Jeanrochdard, Brussels; Koelnberg, Cologne; Brand New Gallery, Milan; and The Hole, New York. He will present solo exhibitions at Brand New Gallery, Milan (Fall 2015) and Valentin, Paris (Spring 2016).